Travel and tourism business leaders must embrace the challenge of constantly changing technology or fail, according to a leading technology consultant. “The change in strategic importance of technology to business is a challenge for business leaders. Cruise travelers who feel like they get onboard and immediately start emptying their pockets of nickels and dimes are not alone. Today’s mainstream mega-ships offer an ever-increasing number of eating, drinking and entertainment options that levy fees atop the base fare. Long gone are the days when a perilous bar bill was the only onboard financial concern. Surcharges and add-ons are here to stay. But there are plenty of noteworthy experiences still included in the ticket price, including Vegas-style shows, thin crust pizza and simple pleasures like free toothpaste or shaving cream. Sure, (optional) surcharges are the new at-sea reality, but it’s still more than possible to find $0.00 on your final bill. Check out our list of the best “free” cruise offerings, and share your own favorites in the comments below. Wondering what’s not included in the fare? See our story on hidden fees — and how to fight back. 1. Blue Man Group. Norwegian Epic is one of only a handful of venues in the world where you can watch the confused blue mutes of the Blue Man Group perform their out-of-this-world percussion-and-paint mime melee — and it’s surcharge free. So put on your poncho, and get ready to get splattered. 2. Cruising’s Best Pizza. Long prized by Cruise Critic readers for its best-at-sea slices, Carnival gave its cooked-to-order pizza a makeover on Carnival Breeze in 2012. And it got better. We’re not talking wood-fired-from-Naples good, but the palate-pleasing pies exhibit an impressive balance of (thin) crust, sauce and cheese — and they come fresh from the convection oven fee-free. It’s rolled out that pizza on numerous ships across the line. 3. Sunset Over the Ocean. It’s one of the most beautiful sights in nature, and it doesn’t cost a 15-cent piece extra. Grab a loved one’s hand (or your favorite cocktail), walk over to the ship’s railing, and take a deep breath. You’ve seen it before, sure, but watching the sunset over the ocean never fails to give you that, “I’m on vacation, and life is good” moment. Enjoy. 4. Ham & Cheese Croissant-wiches. When is a sandwich more than just sliced bread and filling? When it’s Royal Caribbean’s addictive ham and cheese mini-croissant, a flaky, cheese-y, three-bite morsel topped with lettuce, tomato, mustard and mayo. The fee-free mini-wich has long been a staple in Royal Caribbean’s signature 24-hour Cafe Promenade. One word of warning: Post-cruise ‘wich withdrawal can be severe. 5. Big-Screen Wii Battles. If you’ve been honing your video-gaming skills, but never had an audience who could appreciate your expertise, you’re in luck. The entire Norwegian Cruise Line fleet is outfitted with Nintendo’s interactive gaming system, Wii. “Boxing,” “bowling” and other tournaments are offered on most sailings. We recommend you show off properly on the two-story screen in the atrium. 6. All-You-Can Eat Indian. To us, the lack of line for Carnival’s fee-free Tandoor dining option is hard to fathom. The aromatic grab-and-go counter, typically open for lunch, serves up Indian comfort food made by the line’s Indian cooks. Dig into grilled meats and fish, curries, daals and basmati rice alongside essential accouterments like mint chutney, raita and achar (pickle). 7. Dancing Lessons. Country line-dancing, waltz and tango, the electric slide — cruise ships are great places to try out a variety of dance genres without enrolling in Arthur Murray classes (which would levy a fee besides). It’s okay to have two left feet — until you try out your new steps during pre-dinner live music. The couples there have been burning up dance floors for decades. And on P&O Cruises there’s also the opportunity to learn some moves from the professional dancers of Strictly Come Dancing onboard selected sailings. 8. Milk and Cookies. You’re lounging poolside in the afternoon, and all of a sudden you get a craving for something sweet — but you’re perfectly comfortable and don’t want to move. What do you do? If you’re onboard a Princess cruise, you relax while the waitstaff bring over fresh, soft-baked cookies and ice-cold milk. And then you silently wish that you could afford to employ someone to do the same for you at home. 9. Free Cabin Toiletries. We can’t figure out why, but finding Carnival’s famous complimentary in-cabin toiletry baskets always inspires a stupid grin. Inclusions rotate, but on our last Carnival cruise, we sucked on cherry Ludens, and kept hair frizz-free with Pantene conditioner and teeth from turning brown with Arm & Hammer whitening toothpaste. It’s the little things. 10. Surfing at Sea. At-sea surf simulators first debuted onFreedom of the Seas, offering passengers a chance to surf and boogie-board, minus the ocean. It’s now on a number of ships throughout the Royal Caribbean fleet. Although it’s free to participate, you’ll have to sign a waiver, hold on to your bikini top and embrace the possibility of public humiliation by way of wipeout. Not the daredevil type? It’s also free to grab a seat on the nearby bleachers and enjoy the spills. 11. AquaSpa Cafe. With its AquaSpa Cafe concept, Celebrity Cruises is out to prove that healthy cruising is not an oxymoron. The bathrobed, post-gym or -spa treatment crowd flock to the fee-free venue, which proffers salads, sushi and other light-fare foods alongside a few a la carte items (grilled pork, poached salmon). The standard location, Celebrity’s lovely adults-only, glass-covered Solarium, provides just the right backdrop for the guilt-free offerings. 12. Poolside Milkshakes. Most ships do free soft-serve ice cream, but Oceania Cruises steps it up a notch with three flavors of milkshakes (vanilla, chocolate and strawberry) made to order by the pool deck. The ambience is way nicer than a diner, but the treat is just as tasty. 13. Outdoor Movies. The flicks may not be first-run, but admission is free, and you can bring in treats from your cabin or the buffet without having to smuggle them under your jacket. Lido Deck movie screens are even more romantic than the real deal, with prime viewing from the pool by day and on snuggly loungers covered with warm blankets (and popcorn!) at night. 15. People-watching. There is no better free entertainment than positioning a chair in a high-traffic zone on the pool deck, promenade or atrium and watching the antics of your shipmates. From fashion snafus to bizarre behavior and juicy conversations overheard, what you witness on a cruise ship can rival the best reality TV. 17. Broadway Onboard. In the mood to see a Broadway show without paying Broadway ticket prices? You’re in luck. Check out “Hairspray” on Royal Caribbean’s Oasis of the Seas, “Chicago” on Allure of the Seas, “Saturday Night Fever” on Liberty of the Seas, “Rock of Ages” on Norwegian Breakaway or “Legally Blonde: the Musical” on Norwegian Getaway. You can also catch West End and TV stars such as illusionist Derren Brown and classical singing star Russell Watson. And the best thing about this entertainment? — it’s all gratis. 19. Coronary Burgers. If you’re craving a complimentary heart attack on a bun, give one (or several) of Guy Fieri’s burgers a try at Guy’s Burger Joint. This fee-free venue will be added to the pool decks of 14 Carnival ships through 2015, offering burgers on buttered buns with a choice of toppings like blue cheese crumbles, onion rings and chipotle mayonnaise. 20. Mini-Golf. For anyone who wants to avoid crowds and catch some sun without lazing by the pool, top-deck mini-golf is a great option — and it’s free. Offered on some Royal Caribbean, Carnival, Disney, Princess and MSC ships, to name a few, the courses generally aren’t a full 18 holes, but they can still be challenging, as your putting will be affected by the ship’s movement. For an even more competitive twist, join a mini-golf competition, usually offered once per sailing. MSC Cruises said the MSC Divina, a ship that was scheduled to sail year-round from Miami, will be moved to the Mediterranean for summer 2015 before returning for the winter of 2015-16 in the Caribbean. 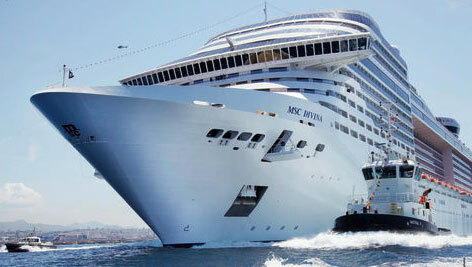 The ship began sailing from Miami in November and was the centerpiece of an MSC marketing campaign in North America. It will continue on current Caribbean itineraries for the rest of 2014 and the first four months of 2015. Industry-wide, Caribbean pricing has suffered from a glut of capacity this year, while demand for European cruises has been surprisingly strong, especially from North America. The weak economies in several European countries and high airfares led some cruise lines to reduce capacity in Europe this year. MSC said the changes to Divina designed to bring it more in line with American tastes will remain in place for its summer in Europe. Upon returning in the fall of 2015 to the U.S., Divina will get some “surprise enhancements” for the North American market. In a conference call with analysts earlier Tuesday, Norwegian Cruise Line CEO Kevin Sheehan mentioned the Divina move, saying its arrival in Miami was a significant addition to capacity in the Caribbean that would be removed next summer.